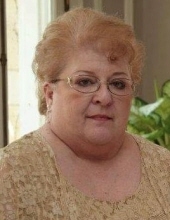 Mary Louise Redell, 68, of East Peoria formerly of Houston, TX passed away Monday, April 1, 2019 at OSF St. Francis Medical Center in Peoria. She was born January 3, 1951 in Peoria to Lynn and Geraldine Winslow South. Her parents preceded her in death. She is survived by her son, George W. (Andrea) Redell IV of Pekin; daughter, Kristina (Cole) Franke of St. Paul, MO; granddaughter, Evelyn Redell of Pekin; grandson, Alexander Redell of Pekin; sister, Marsha (Marvin) Zuleger of Surprise, AZ and Manny the cat. Mary worked in the financial services industry until retiring in 2013. She was very active in the Episcopal Church in Houston. She loved crocheting, sewing and cross stich. Cremation has been accorded and a private celebration of life will be held. Memorials may be made to the COPD Foundation in her name. To send flowers or a remembrance gift to the family of Mary Redell, please visit our Tribute Store. "Email Address" would like to share the life celebration of Mary Redell. Click on the "link" to go to share a favorite memory or leave a condolence message for the family.